The development we see around us has not contributed to the welfare of all. Working for one’s own narrow interest is not Karma yoga. Our saints and visionaries make us learn that one has to go much beyond. They are remembered and worshiped because they worked for the good of others, the welfare of society and the nation. Swami Vivekananda had said, “Expansion is life. Contraction is death,” and we have to abide by this. Karma yoga also entails that whatever is performed is in tune with Swadharma. Equanimity is one of the greatest of quality that the Gita upholds. The wise person sees no difference among various life forms. The behaviour may vary according to the relationships they have, but they will perceive everyone as equal. From this viewpoint of equanimity they try to work with no attachment and seek to bring in welfare for all. A VKIC publication on Sister Nivedita – the ardent disciple of Swami Vivekananda – was released on the occasion. 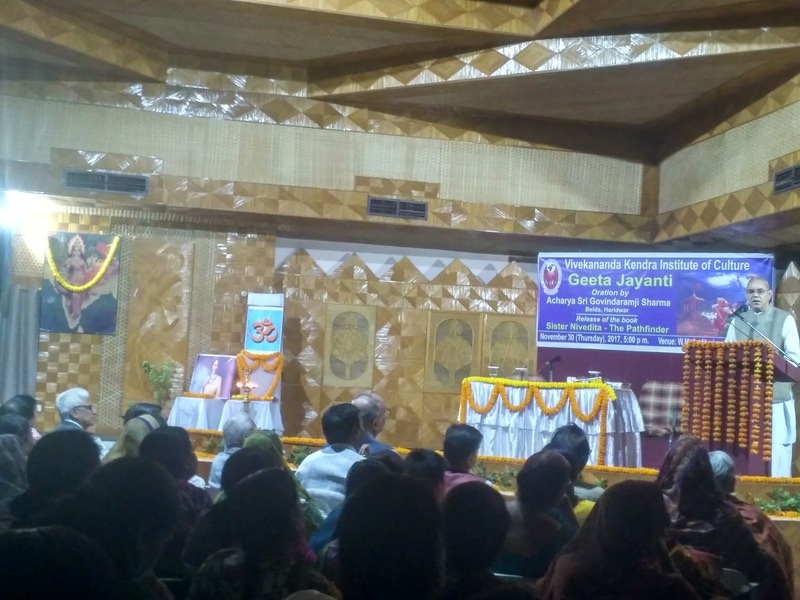 The Editor of the book, Dr Mukunda Rajbongshi spoke briefly about the life of the great Indian nationalist who also made significant contributions to girls’ education.